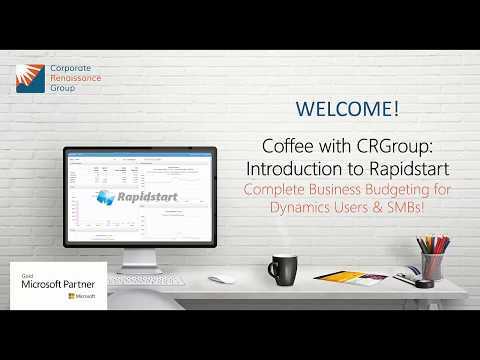 Rapidstart is a budgeting and forecasting software designed to help SMBs budget, analyze, monitor and plan their business’ finances simply and accurately using a range of features, including annual budgets, chart of accounts (up to 300) and profit and loss projections, plus cash flow projections, multiple entity support (up to 5), dashboards, and more. A flexible solution, Rapidstart enables users to work anytime, anywhere, on any internet-enabled device, including desktops, laptops, tablets, and mobiles, both on and offline. Designed to replace complex spreadsheets, Rapidstart offers a centralized and collaborative platform from which to consolidate financial analysis and planning. Rapidstart ensures users have full control of their business by providing complete visibility into everything from the budgeting process through to rolling forecasts. Since Rapidstart requires no modelling or technical skills, users can get up and running quickly. A multiple scenario creator, plus configuration management tools enable users to customize Rapidstart to their specific business needs. To help users analyze, plan and track financial performance, Rapidstart supports standard and custom reports, dashboards and balance sheet projections. Reporting capabilities allow users to gain actionable insight into financial performance, and help inform decisions regarding cash flows and cost actuals. Rapidstart also incorporates a payroll module, inter-company elimination journaling and a Capex module. Multi-currency options support global business activity while integrations enable users to transfer data seamlessly between ERP systems like Dynamics GP and Rapidstart. There are currently no reviews of Rapidstart. Starter license package: $3150 for 12 month subscription for 1 power user, 5 standard user licenses, standard hosting, and technical support. Additional user licenses: $650/year for power user (administrator) license, and $500/year for standard user license. Rapidstart is simple and intuitive, requiring no modelling or technical skills to set up and use. Users can customize Rapidstart to their specific business needs with multiple models and calculation methods, as well as configuration tools. Rapidstart’s cloud-based solution gives users the flexibility to work anywhere, anytime, from any internet-enabled device, including tablet and mobile devices. Standard and custom reports help give users actionable insight into the financial performance of their business. Integration support options allow users to transfer data seamlessly between ERP systems such as Dynamics GP and Rapidstart. Below are some frequently asked questions for Rapidstart. Q. What type of pricing plans does Rapidstart offer? Q. Who are the typical users of Rapidstart? Q. What languages does Rapidstart support? Q. Does Rapidstart support mobile devices? Q. Does Rapidstart offer an API? No, Rapidstart does not have an API available. Q. What other apps does Rapidstart integrate with? Q. What level of support does Rapidstart offer?